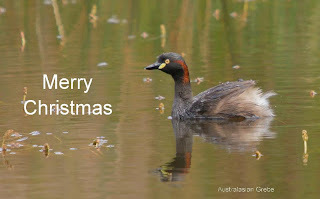 I recently photographed this Australasian Grebe on a small farm dam. 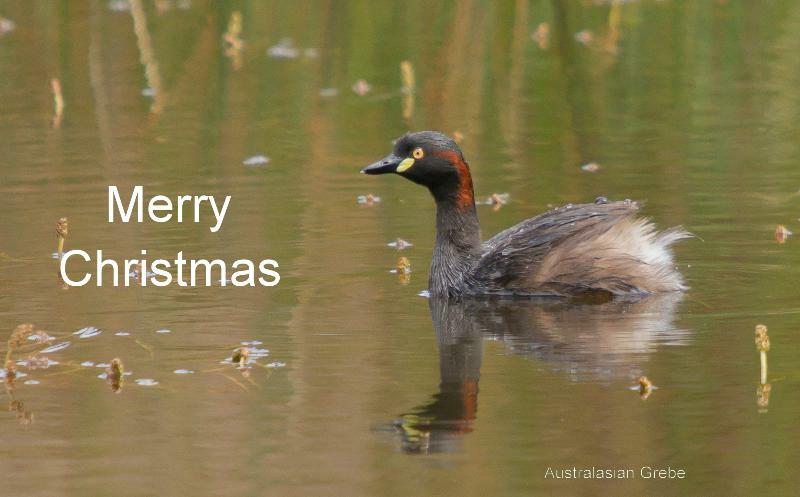 These grebes have made a slow and sustained increase in numbers over the last 30 or so years, thanks largely to the increase in water storages on many farms in the east and south-east of Tasmania. Unlike their near relatives, the Hoary-headed Grebe, which are usually found on large bodies of water and in flocks sometimes numbering in the hundreds, this grebe is more likely to be met with in pairs or small groups on small water storages--the largest group I've seen in Tasmania totalled only 5. I stopped off briefly at Lauderdale Spit recently en route to Pipeclay Lagoon. It's become almost a ritual and I rarely spend more than a few minutes scanning the waders, gulls and terns from a 'respectful' distance. 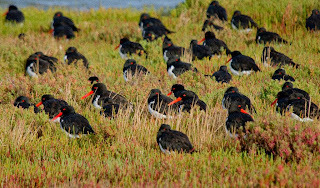 I noted the Pied Oystercatcher roost still consisted of 200 or more birds, a seemingly large number during the breeding season. As I passed the resident pair near the highway, I could see they were becoming agitated by a third bird nearby. I stopped to watch and as the 'interloper' closed on them, one of the pair proceeded to 'dive-bomb' it. It ran off through the shallow water, and as it did I noticed it appeared to be banded. This wasn't unusual as many Pied Oystercatchers have been colour-banded in southern Tasmania over the years, and subsequent sightings have delivered a large amount of useful information.. I often photograph them for later identification if I can do that without unduly disturbing the roosts. I walked out into the water and slowly moved the 'intruder' onto the beach a few metres away. 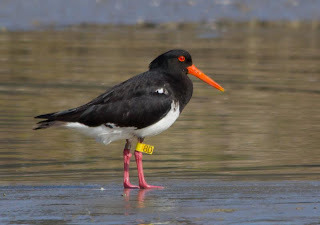 As you can see from the accompanying image, the oystercatcher didn't sport colour bands, but a yellow 'flag' with "8D" on it. 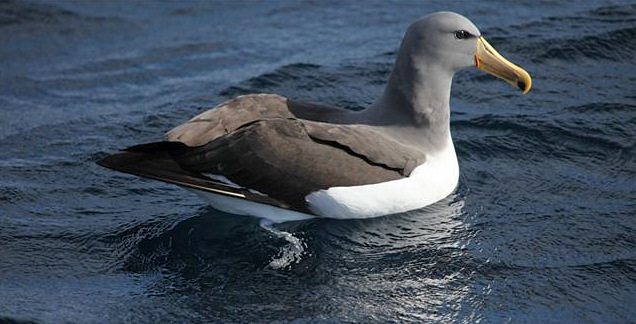 From the flagging protocols, this bird was so marked at Corner Inlet in Victoria, around 470kms away. I'm still waiting for additional information as to when it was originally caught. From local banding efforts it appears that few of 'our' oystercatchers stray outside of the Derwent and Pittwater areas, so one wonders what drives a few to travel hundreds of kilometres. This Victorian bird was showing interest in one of the resident pair I mentioned earlier, and one could fantasise that the journey was as a result of unrequited love. But I'm sure I'll be taken to task for even jokingly suggesting it!! Finally received the banding information on this bird. Originally banded at Barry Beach, Corner Inlet, Victoria on 13 August 2006, aged 4. Now 10 years old. A few weeks back, I had returned to Pipeclay Lagoon to try to find a single Sanderling (a small migrant wader) I had seen there a few days earlier. To say I had "seen" it, doesn't tell the whole story. I wanted to try my hand at video, and had decided that shooting a small flock of waders would be a cinch, it wasn't! But as I reviewed the footage on my PC, I realised that among the Red-necked Stint was the aforementioned Sanderling. This species is mainly found on ocean beaches, and I don't recall ever seeing one in the Hobart area. So I had returned to try taking some 'stills'. I quickly located the wader flock of around 100 stint, but clearly the Sanderling was absent. As I was walking back through the tussock grass, I became entangled in discarded old fencing wire, fell full length, saved the camera, but aggravated a recent leg injury--yes, very amusing! So my recent outings have been limited to birding from my vehicle, with occasional forays close by. I guess the good news is that a vehicle makes a great hide, and it's amazing how trusting birds are to their approach. So the accompanying shots were taken from my vehicle around the perimeter of the lagoon. All of the birds were at some part of their breeding cycle. 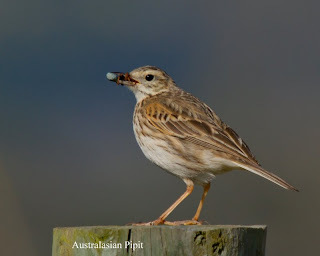 The Australasian Pipit, found Australia-wide, was carrying food, in this instance a large spider, to a nearby nest among the tussocks, stopping off atop the fence post to survey the area for possible threats. I've rarely photographed them, although quite common in many open areas of the state. They sometimes occur in close proximity to the more commonly found Eurasian Skylark, a species introduced in the mid 19th century. These 2 species are very similar in appearance, and can present an ID challenge as you flush them from grasslands. The pipits form small flocks in winter, and live a nomadic life. One winter's morning, in a gale, a flock took refuge in my and surrounding gardens, very much in suburbia. Not exactly pipit habitat. 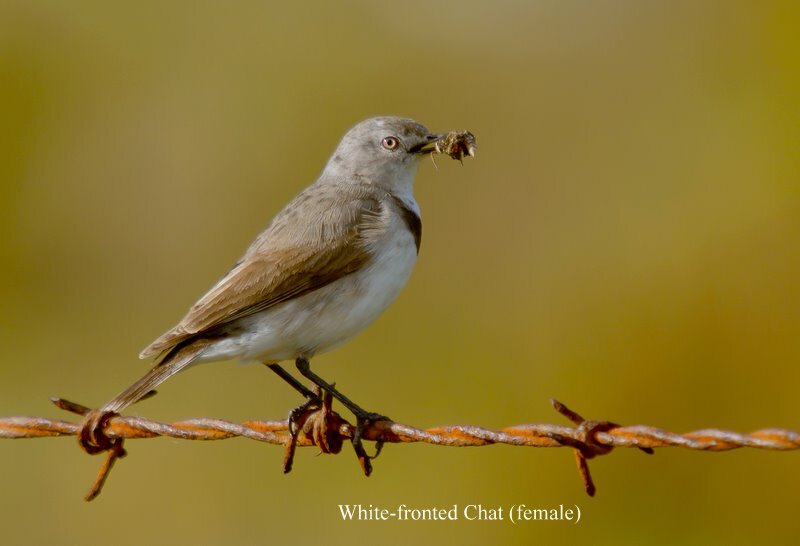 The White-fronted Chat, another nomad, was among several pairs feeding nestlings, again using the fence as a vantage point. They appear to breed throughout the spring and well into summer, appearing suddenly in an area, breeding, and just as quickly moving on. Usually found in family groups, they flock in the colder months, forming substantial flocks, often seen roaming the open countryside. 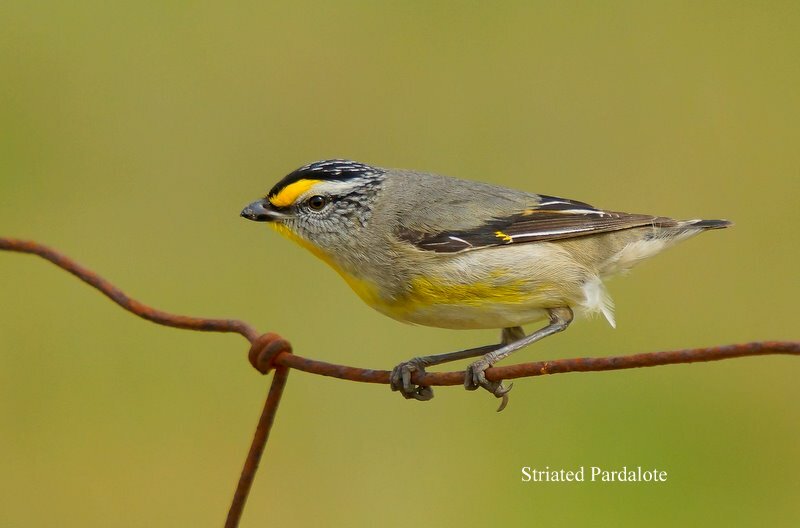 Lastly, and size-wise, the least, I photographed a pair of Striated Pardalote nest building, also using the fence as a vantage point. In the open country around Pipeclay Lagoon, they nest in holes in the ground or in sandy banks, but in wooded areas, they usually choose holes in trees, sometimes several in the same tree. I spotted this pair carrying long lengths of dry grass to their nearby nest hole. 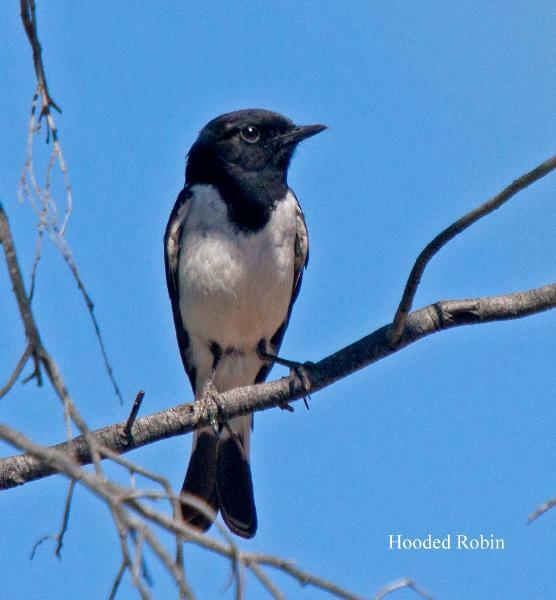 Of the 3 mentioned, they are the only true migrants, moving to the Mainland in winter, although a few may remain . Of course these 3 species are by no means the only 'fence sitters', but I'm grateful for their cooperation! One of my favourite birds is the Pink Robin, but they are often elusive, live in dense forest, and are mainly dark in colour and photographing them is often a challenge. I've found that spring is the best time to attempt photography, usually when the male is "announcing" his territorial rights. My philosophy on photographing this species is to visit various local known sites and hope. Hope for a "collision" of events--a cooperative bird, the right situation and the right light. That's not too much to hope for, is it! 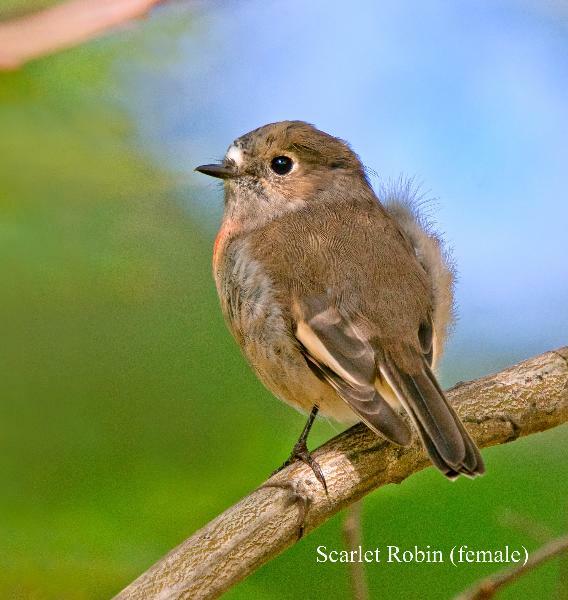 The other option is to wait for winter when these robins often frequent the edges of their usual wet forest habitat. ielangta Forest that the "collision" occurred. I've made a few trips to the Wielangta Forest this spring, few have produced much in the way of bird images, but it's a good venue for wet forest and rainforest species if you're prepared to put in the effort. The road is now open again, but not in great nick, and care is especially needed around the new bridge. The walking tracks are generally overgrown and have numerous fallen trees across them both large and small, making a walk more like a steeple chase. But from personal experience, there's no lack of leeches. The visit that I finally managed some shots on was about a month ago and as often happens, I wasn't expecting it. 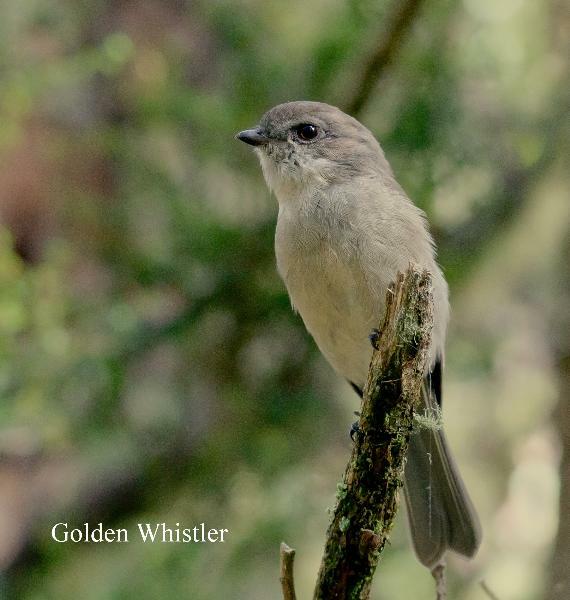 I had only walked a few hundred metres from the road, when I heard an Olive Whistler calling, and stopped to find it. This was shortly followed by first a Bassian Thrush, then a Flame Robin calling, both from nearby dense bush. I endeavoured to locate them, but failed on all counts. A Tasmanian Thornbill and a Tasmanian Scrubwren scolded me as I pushed deeper into the scrub, arriving at a small clearing surrounded by dead or dying shrubs largely covered in lichens. I stood and surveyed the area, hoping to at least find the still calling Olive Whistler. I knew from previous visits that this was a likely spot for the whistler. 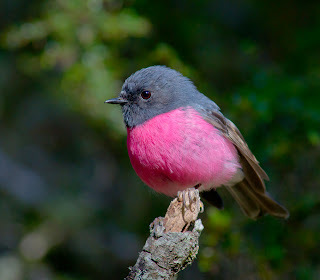 A movement to my right caught my eye and a Pink Robin appeared. I stood completely still to allow a hopefully close approach. He called, flew to another branch and called again. There was dappled light passing through the forest canopy, and several potential perches around the clearing, and despite the low light level, I began to get quite excited at the possibilities. However this was tempered somewhat by previous attempts which didn't exactly measure up to my expectations. As you can see by the accompanying images, I did manage to get some useable images, but as always I was left with the feeling "maybe next time". [I could have used flash, but that would have"killed" the ambience, and affect the birds' behaviour.] Over the next 40 minutes I stood, watched, and occasionally photographed this robin as he went about his business. Mostly he took food from among the leaf litter and moss covered ground, pouncing on it from a perch, although I couldn't identify exactly what his prey was. On a number of occasions he came within a metre or so of me, looking, I thought, rather accusingly at me, but otherwise seemed unfazed by my presence. 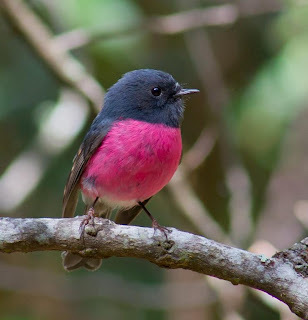 At close quarters, it's size becomes very apparent--it's small (c.12cms), as does the sheer beauty of the pink breast contrasting with the sooty colour of the head and body--so hard to adequately capture in photographs. 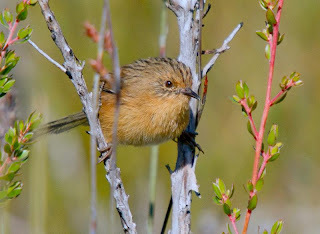 The female put in a brief appearance, as did several Tasmanian Thornbills, gleaning insects from beneath the leaves of various shrubs. Eventually the wind rose and scudding clouds appeared followed by light rain. Time to leave. I hoped that I had not intruded in this birds' life in vain, but at the very least I had been 'privileged' to spend time watching this sometimes hard to find bird. A report on Birdline Tasmania at the weekend, caught my eye as much from the observers' comments as from the content. 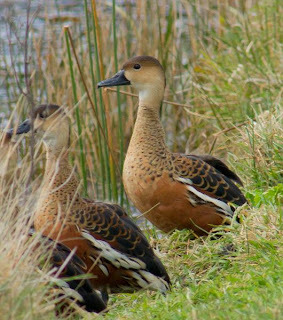 Ian Lundy reported seeing 3 ducks at Lake Dulverton, that he described in detail, believing that the birds in question were Wandering Whistling-Duck. He was not able to get any shots with his phone (photographs have become almost mandatory for rare bird sightings). He concluded by saying: "this bird is not found anywhere near here but it is what I saw--please tell me I'm not going crazy". 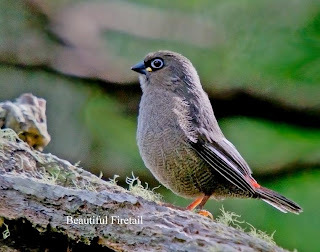 This species breeds in the tropical north of Australia and is uncommon to rare further south, and as far as I'm aware, has not been recorded in Tasmania before, so I guess Ian's comments are not unreasonable. Being old and sceptical, I awaited developments and they were not long in coming. Paul Brooks sent me an email saying that he had subsequently seen them, confirmed their identity, and thought that it might be possible to photograph them. I have to say I wasn't particularly enthused, my twitching days are largely behind me, but as Lake Dulverton is almost always worth a visit I gave a lukewarm reply. Consulting the weather forecast for the rest of the week suggested a visit might be better sooner than later, so on Wednesday morning I set forth. It's an hours drive from Hobart an d although I set off in high hopes, as I approached Oatlands (where the lake is situated), the weather noticeably deteriorated. At the Mud Walls dam the wind was wiping up waves and this usually good spot for duck held absolutely nothing! Not a good omen. On to Dulverton. I pulled in to the small carpark overlooking the spot that the previous observers had indicated the birds had been sighted. Looking along the dam wall I could see a flock of about 15 Little Pied Cormorant roosting, and close by, tucked close to and largely hidden by tufts of sedge, I could make out 2 ducks, but the limited view indicated they were almost certainly the birds in question. I then, with the benefit of hindsight, made a gross error of judgement. I got out of the car! The cormorants took off and so too did the duck. Worse, I didn't see where they headed to. I spent the next 3 hours around the shores of the lake. I watched the very flighty flocks of Hardhead, there were over 500, by far the largest numbers that I've ever see in Tasmania. I noted a few Blue-billed duck, a single pair of Australian Shelduck, and many hundreds of Eurasian Coot. There were noticeably few 'dabblers' such as Chestnut Teal and Black Duck. I then returned to the starting point, and lo and behold, the 'whistlers' were back, and so were the cormorants. No problems this time though. I descended the bank to the shoreline and bird by bird the cormorants flew off leaving the 3 Wandering Whistlers and I shot off several images, one shown. I decided to attempt to approach along the dam wall. 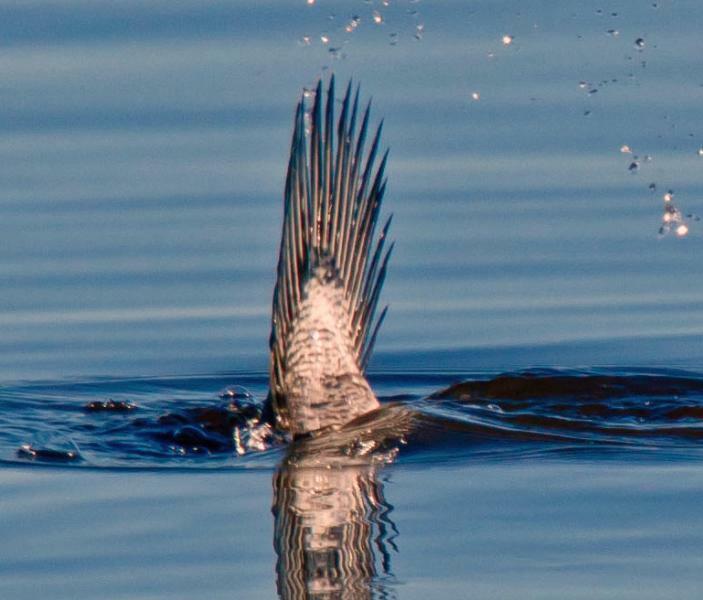 I fired off 3 or 4 shots before they flushed, landing about 30 metres away among the low, but dense vegetation of the lake. I met Els Wakefield shortly afterwards, she was also after photographs of them, and reported that they were now back where she had seen (and photographed) them earlier. Comparison of notes and digital images ensued. I was if anything, relieved at managing to get a few shots, particularly in the blustery conditions which made all the duck very flighty, and I was still annoyed with myself for earlier having flushed them from the dam wall. 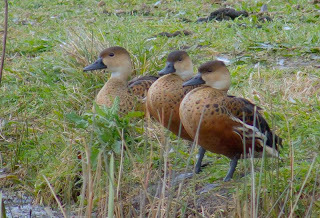 With the aftermath of the Mainland floods, with good conditions for waterbird breeding, it probably isn't surprising that these duck have turned up. I think there will most likely be more unusual sighting of "mainland" species. A question has been raised as to the possibility that these birds are "escapees" from a waterbird collection or zoo. 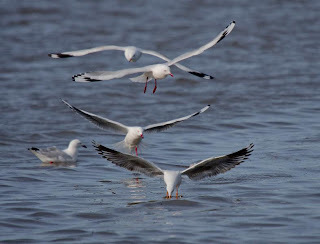 While impossible to rule out, I think the behaviour of these 3 birds suggested that they are wild birds. The pelagic trip, led by Dan Mantle from Canberra, left Pirates Bay (Eaglehawk Neck) and headed straight to the Continental Shelf drop off on board the Pauletta. Many of the birders on board had made hundreds of trips, but declared Saturday's (3rd September) the best ever with a huge variety of birds and great viewing conditions. The highlight of the day caused a rush to the side of the boat. 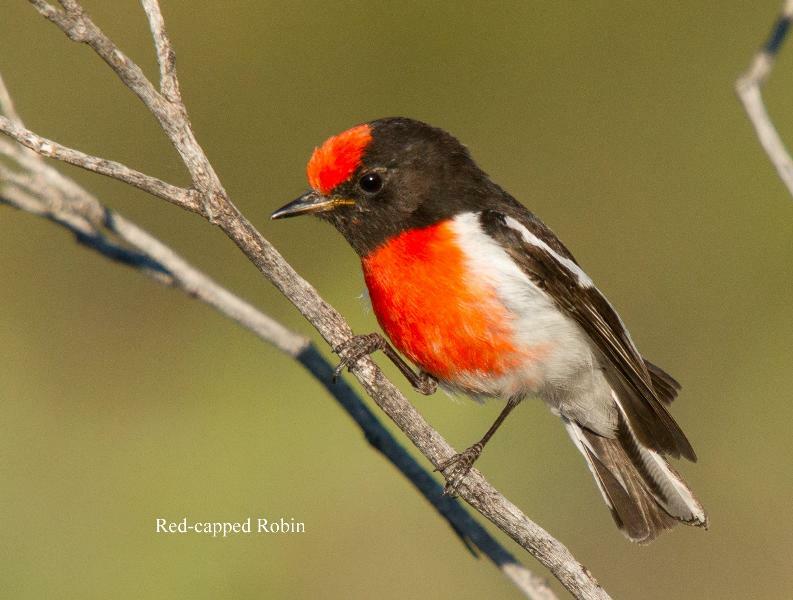 It was what we call a "lifer", as nobody on board had seen it before and it was Tasmania's first record ! I understand that 2 or 3 have been recorded off the Australian mainland. The bird was a Chatham Albatross (Thalassarche eremita), previously considered a form of Shy Albatross (Thalassarche cauta), commonly seen in Tasmanian waters. It's a handsome bird, with grey head and neck and an enormous yellow-orange bill. Some called it 'banana-bill bird'. As it appeared in the distance little did we realise that it would come right up to the stern of the boat, enabling all to ID it and take photographs. A similar trip the following day, failed to locate the bird. While my son and I were fishing the River Derwent recently, without much luck, we were heartened to see flocks of Silver Gulls, with the odd Kelp and Pacific Gull present too, working their way up river towards us. 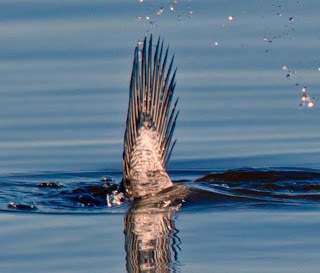 From previous experience, this can often be an indicator of fish, such as salmon or couta, chopping up bait fish, with the gulls picking up the odd morsel. Well the flock passed and despite much casting of lures, there was no sign of any fish. I took a few shots to see if I could ID what they were eating, but I couldn't resolve anything on the camera's LCD screen, but it did intrigue me. 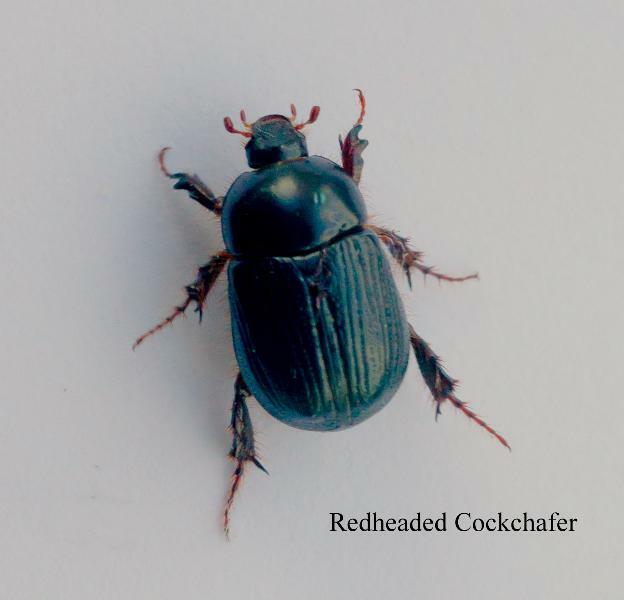 story quoted Dr. Cathy Young, the Tasmanian Museum's entomologist, as saying that these 15mm beetles, Redheaded Cockchafers (Adoryphorus couloni) were particularly common at this time of year. Apparently they spend much of the year in the ground as grubs, chomping up the roots of lawn and pasture grasses and as such they are a considerable pest. "Then as soon as we get to this time of year--late winter and early spring--they emerge (from their pupal cell), mate, reproduce and then die" she is quoted as saying. They have a lifespan (as a beetle) of only a week or so. We had noticed a large group of several hundred beetles on shore--all dead--that was swept downstream as the tide rose, but hadn't realised they were the 'target' of the gulls. Looking at the shape of some of the gulls, they had seriously overindulged! My son, also a keen birder, persuaded me to go fishing, and during the last week or so, we've fished various local venues with mixed results. But if you're a birder, however hard you try, you just can't help noticing the birds. So a few days ago we were fishing the River Derwent not far from the Bowen Bridge. As we arrived, my son pointed to a distant cormorant, which was silhouetted against the light from the just risen sun. It appeared to have caught a fish, which gave us some hope. The truth, as we soon discovered, was very different! Quickly getting our lines into the water, we soon realised that there were a dozen or more cormorants apparently fishing at various spots. I opted for them being "Little-pieds", a common cormorant in the Derwent at this time of year. I had my binoculars with me, and I soon found that the passing birds were apparently carrying nesting material. I followed one as it flew up the river and landed on the bridge pontoon half a kilometre away. That seemed a very odd place for a Little-pied Cormorant to nest, as they usually nest in trees! 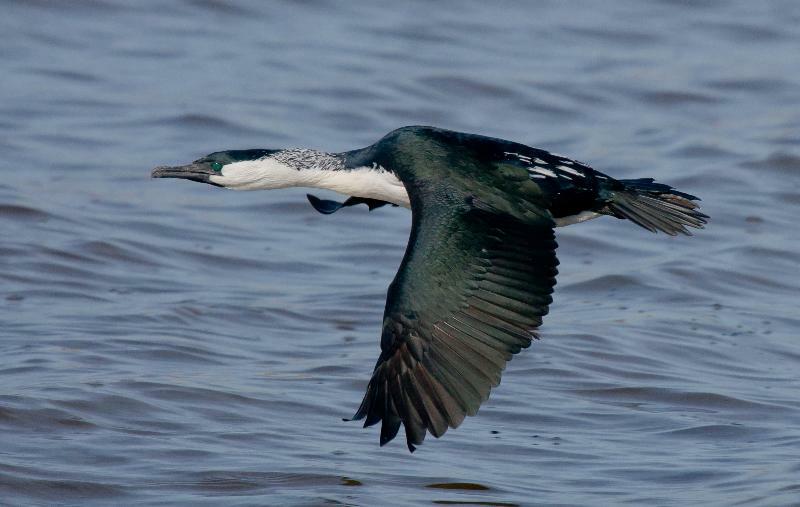 Then the penny dropped, they were Black-faced Cormorant, (also called Black-faced Shag). 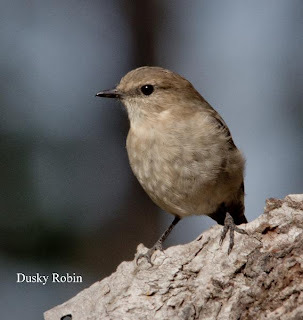 While this may not seem worthy of mention, as these birds are commonly seen in the Derwent, especially during the winter, they normally breed on isolated stacks and islets, such as Maatsuyker Island and the Hippolytes, to name two in southern Tasmanian waters. Some years back I recall visiting a colony on Little Betsy Island, close t o the mouth of the Derwent. So this site, at the base of the bridge supports, is an unusual breeding site, and several kilometres 'inland' from the river mouth. I counted 16 or more nests, most with sitting birds, but as I could only see one side of the supports, I would guess that there may be twice that number in the colony. 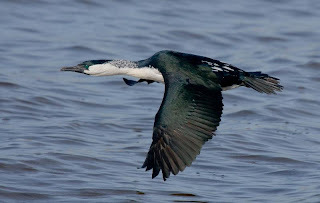 I got the camera out of the car (I feel 'naked' without it), and I soon started taking shots of passing cormorants, which proved difficult in the prevailing light conditions, not to mention that the birds are travelling at speed. 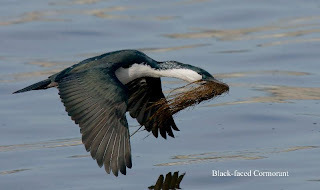 As I have mentioned, this species mainly breeds well offshore, so I suspect the activity of gathering nesting material is seldom witnessed or photographed. The material they collected consisted mostly of seagrass, and the occasional twig, some nearly as long as the bird, which they dived for. There was a lot of it in suspension in the water, so I'm guessing that they only had to gather it up. Some dives lasted up to 40 seconds. They seemed surprisingly fussy about the material as they sometimes emerged with a bundle, which they then rejected and dived again. Mostly the material was collected by only single birds, but occasionally an apparent pair dived together. As they sped passed, I noted that some appeared to be in moult (see lower image), but thought that unlikely during breeding, as moult imposes considerable 'stress' on birds. At home, looking at HANZAB (the bible of Australasian birding), it appears that they produce these white nuptial plumes and filoplumes, (on back and neck) during the breeding season. I have to confess I've never noticed these before. Well the fishing was ****, the birding was good and I've learnt a lot about Black-faced Cormorants! On Thursday 28th July, following a protracted illness, Dr. W.(Bill) C. Wakefield died. Many people in the northern suburbs of Hobart will remember him as their local GP, but probably didn't know of his passionate interest in birds. In recent years, Mainland birders would have met him on one of the many seabird trips that he organised or participated in, out of Eaglehawk Neck on the Tasman Peninsula. Although our paths rarely crossed in recent years, for over 40 years I've always considered Bill a close friend. I and my family still have fond memories of our holidays at Coles Bay that we shared with both his and Mike Newman's family. Of Bill, Mike and myself pushing his "tinnie" across Moulting Lagoon on an extremely hot day, probably wondering why we were doing it, only to find a small flock of waders that included both a Little and Long-toed Stint, both first records for the state! Of the wee drop (or two) of Glenfiddich that he produced to round off the day. I first met Bill at Bird Observer's meetings (forerunner to Birds Tasmania), but got to know him better during the heady days of the Tasmanian Shorebirds Study Group in the 70s, when the group started cannon netting gulls and waders. Our enthusiasm sometimes got the better of us as I recall the pair of us using a small cannon net on Lauderdale Beach to catch and band Silver Gulls. I assumed he had the necessary "authority" by way of permits, and he assumed I had--suffice to say that neither of us had! I also recall that he insisted on continuing long after dark, and we could only read the band numbers by the light cast from a neighbouring petrol station. I have many other memories of course, and they all illustrate Bill's great enthusiasm and care about Tasmania's birds. I, and I'm sure many others, will miss him. My condolences go to his wife, Els, and his three sons, Gavin, Andrew and David. About a month ago, I received an email telling me about a sighting of 4 Crested Grebe at Orielton Lagoon, seen during the annual winter gull count conducted by Birds Tasmania. The note mentioned 2 adults, an immature and a juvenile. The latter quite unusual here. Crested Grebe are not that common in Tasmania, with most sightings from Lake Dulverton, the Derwent River in the Granton area and at Orielton Lagoon. At times, at the latter site, they have numbered up to 40 or more, but in recent times, they have been conspicuous by their absence. I've found that early morning on still days is the best, or at least the easiest time to look for ducks and grebes at this venue. As luck would have it, the day following receipt of the email, was ideal if cool (around freezing po int) and I set forth. Early morning on Sorell causeway is not the ideal birding spot, with the commuter traffic whistling past, but fortunately there's a 'lay-by' mid way from which much of the lagoon can be scanned. (Watching from within your vehicle is a good option here). A quick look suggested that there wasn't much about, save for several Musk Duck and a raft of Hoary-headed Grebe, numbering perhaps a dozen. The numbers of both the Crested and Hoaryheads have been low recently, and I suspect that the high Mainland rainfall is to blame. The numbers of grebes and also the Eurasian Coot seen in Tasmania, fluctuate widely, and they only breed here in small numbers, so it's reasonable to assume that most are Mainland bred birds. When I first came to Tasmania, over 40 years ago, I didn't see a single Coot for over 2 years, and this puzzled me as Sharland's Tasmanian Birds declared it to be "generally common". But when they did appear they were 'everywhere', with some flocks in the Derwent River consisting of over a thousand birds. A visual sweep of the lagoon showed no sign of the Crested Grebes. 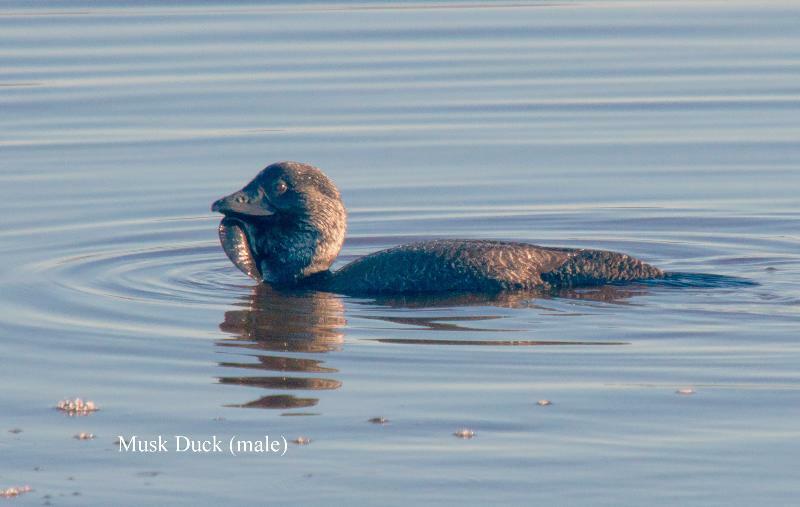 Alongside where I had parked, a single male Musk Duck was diving for food. I haven't had much luck trying to photograph this species, not that they rate highly on my "must do" list, so I thought I'd give it a go. I've been waiting for minor eye surgery, as luck would have it, on my "good" eye, the right--I can't actually see whether the image is in focus or not, something of a handicap using a telephoto lens. The low angle light didn't help photographing an all black bird either. Well as you can see from the accompanying images, I did manage a few shots, nothing to write home about, but definitely thanks to the benefits of auto-focus. 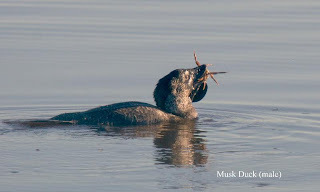 One of the images shows the duck eating a crab, and in the several dives that I witnessed, crabs were obviously the food of choice. I'm not sure what I thought Musk Duck's diet is, but I didn't expect it to include crabs. Literature suggests aquatic insects, but also crayfish, so perhaps crabs aren't that unusual. The lower shot taken as the bird dived, shows the stiff tail, peculiar to both this species and also Blue-billed Duck. Later views of the lagoon suggested that the sought after Crested Grebes had moved on, but it's often worth a look as you cross this causeway. Hoping that the low cloud would eventually lift, I had delayed my departure for a morning's birding to the South Arm area. The commuter traffic had long gone and I was just cruising, cursing yet another heavily overcast day that was not very conducive for photography. I passed a Brown Falcon feeding on the carcass of a freshly roadkilled rabbit, a not that unusual occurrence, but most likely to occur mid winter when conditions are harsher. I slowed, but drove on, as from my experience stopping close to any bird alongside of the road is a recip e for the bird to rapidly depart. A kilometre on, I changed my mind (also a not unusual occurrence!). Two U-turns later, I slowed to a crawl, worrying about how close I dare get. Fortunately there was a shallow and wide drain on my side of the road, and I headed down and stopped. The falcon eyed me off, but kept feeding. I took a few distant shots, but realised I needed to get closer. Gingerly, keeping my eye on the 'brownie', I edged closer. It kept on feeding. Still virtually 2 road widths away, I stopped. I watched the falcon for the next several minutes, taking the occasional shot as it tore chunks of flesh off the rabbit, and gulped the meat down. It fed rather frantically as if it hadn't eaten for ages, but perhaps also knowing that once the ever present Forest Ravens found the carcass, it wouldn't get a look in. 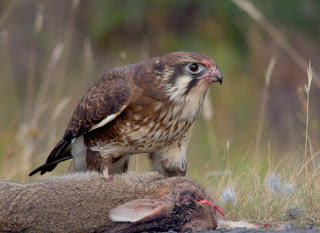 Ravens and Brown Falcons have an uneasy relationship at best, and I only recall seeing them feeding together once. That was in mid winter in the highlands close to the Great Lake. Heavy snow had fallen and a single Raven and a 'brownie' were feeding side by side on the carcass of a long dead Brush Possum. Probably neither had eaten for sometime, and chasing each other would have been counter productive anyway. I think this bird is most likely in its' first year, judging from the colouration, and as yet lacks the skills of its' parents and will take whatever it can get. It gave an excellent opportunity to get some shots, but in the low light many suffered from 'movement'--the bird was feeding rather frantically. The shot at top left almost looks as if the bird was 'mantling', but it was in fact stopping itself overbalancing as it vigorously tore off pieces of meat. 'Mantling' is a term describing the action of a bird of prey as it spreads its' wings over prey thus hiding it from other predators. 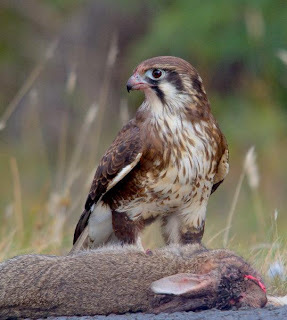 It's a falconry term and comes from the old English word for a cloak. Non raptors also perform this act and I've seen Grey Butcherbirds mantling. Inevitably, a passing car flushed the falcon off the roadside, and it flew into the lower branches of a nearby gum only to be mobbed by several bush birds, led by Noisy Miners. 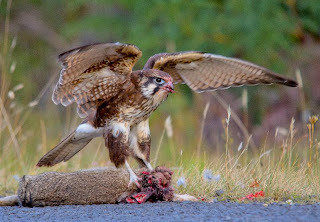 I decided to move away, stopping only to move the carcass onto the verge to enable the raptor to feed rather more safely. The rest of the morning seemed rather mundane after that. I thought it was time I ventured farther afield, and with the run of great weather last week, I headed to the Gordon Road and into the South West National Park. Well it nearly didn't happen as the clear weather around Hobart, turned to heavy mist and later thick fog in the Derwent Valley, but more in hope than expectation, I pressed on, and I'm glad I did. I finally drove clear of the fog at the Thumbs lookout, the highest point on the Gordon Road, and the weather beyond was fine, still and without a cloud in the sky. Time to start birding. 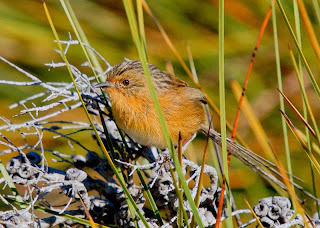 I made several stops along the road, mostly alongside button grass plains, in search of one of my favourites, Striated Fieldwrens, and I wasn't disappointed. 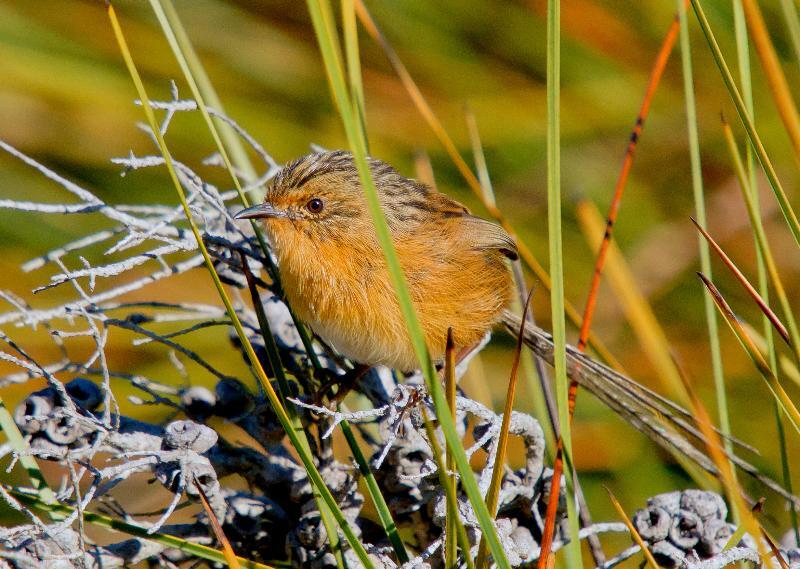 Although these birds are found widely around the state, my 'mental' picture of them is in these plains, singing from the tops of button grass stems, particularly during spring. But I'm digressing. caught sight of an orange blob in a distant flowering banksia. I had hit 'pay dirt'! 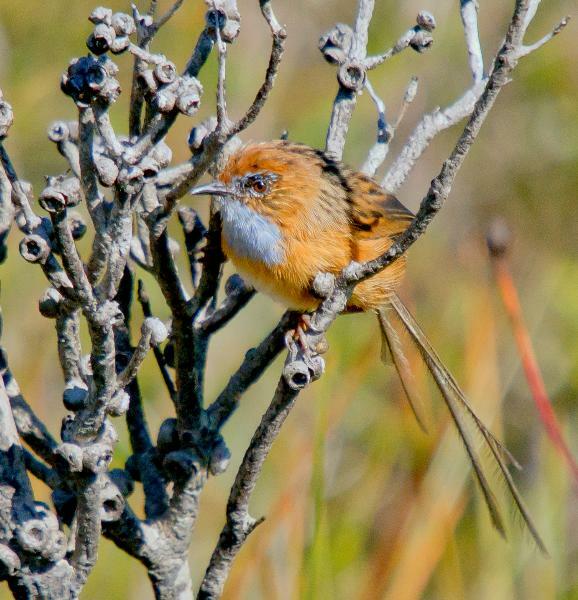 A single Southern Emu-wren, but I was sure there would be more. The area was beyond a drainage ditch on the edge of a vast button grass plain and among stunted burnt tea tree and hakea, cutting grass and sedges, with the odd regrowth bushy banksia marginata. It was extremely boggy. Pulling on gum boots I slopped my way towards them, trying hard, and failing, to avoid the ends of the burnt tea trees. 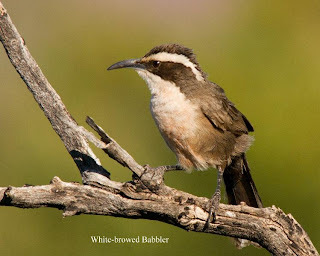 all within 30 metres of the road, I found 2, possibly 3, family groups of Emu Wrens and I spent the next hour or so watching them as they went about their business. I say watching, but in reality, I spent more time watching the movement of grasses and shrubbery, as they hunted for insects, occasionally climbing higher to look around. All this was possible because of the total stillness of the day. By "pishing" and "squeaking", I occasionally managed to entice them close enough to get some images, but to say they were shy is an understatement, they mostly just observed me through the grass. Infrequently they gave a single note call, not unlike a pipit's, and for a while I thought there must be some other species present too. They spent some of the time on the ground, searching around the edges of the numerous pools, but never more than 'inches' from cover. In the past I've noted that they usually carried their long fine tai l feathers 'cocked', but as you can see from the images, they weren't. Perhaps this is related to the breeding season being over. Late morning the action just stopped, and I have no idea where they disappeared to, but I know from experience they have a great ability to hide in clumps of cutting grass for extended periods and I just counted myself fortunate to have enjoyed their company. I sploshed my way back to the car, covered in much mud and bearing the 'scars' from burnt shrubbery, but feeling exhilarated and very content. Southern Emu-wrens are by no means rare in Tasmania, but they can be difficult to locate. Much of the west and south west coast is arguably their stronghold, but they're also found in highland areas far from the coast. Several times lately I've heard a bird call that I couldn't identify, from somewhere close to my house. Frustratingly, I had failed to even locate it. That was until yesterday afternoon. Sitting in front of my PC with doors and windows open, I heard a nearby commotion. Something had the local Noisy Miners and Little Wattlebirds stirred up and I went outside to investigate. Clearly their focus was on next door's Ash tree, but equally obviously it was deep among the foliage. I had searched for several minutes without success when a bird shot out of the tree and down the garden. 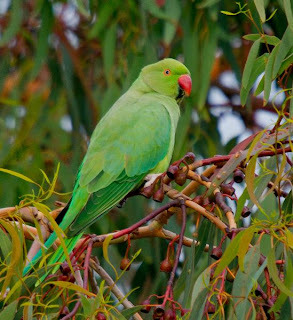 I had a fleeting view of a beautiful green parrot, quite large and a great flyer, as it sped away. 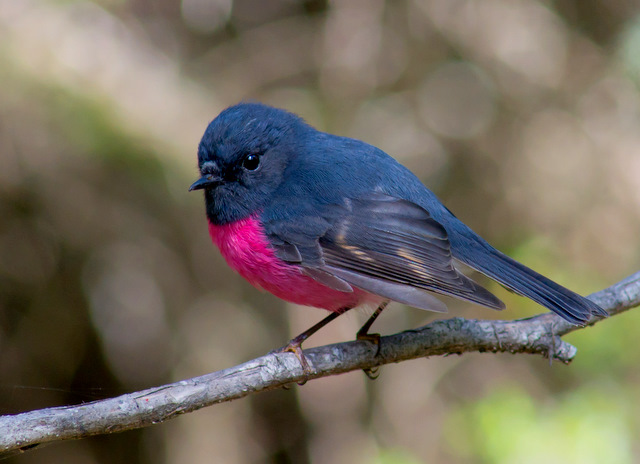 Beautiful as this bird may be, introduced bird species often end up as pests. Many owe their presence in the wild, to aviary escapes. Some threaten our own bird species. The Rainbow Lorikeet springs to mind as a species that interbreeds with native species and has the potential to do serious damage to fruit crops. The cost of eradication, if this problem is not dealt with quickly, could be enormous. I've walked around a nearby reserve on numerous occasions lately, mainly because it's flat and easy walking as I'm still trying to throw off a persistent chest infection. I feel I'm on nodding terms with some of the feathered inhabitants, but have refrained so far from giving them individual names; it's tempting, but my imagination doesn't stretch that far. The upside of walking the same areas regularly is that it gives the observer an insight into the daily lives and movements of some species. Their presence or otherwise seems, probably predictably, linked largely to temperature. On a cold morning I've usually found several species foraging on the ground, even species like Dusky Woodswallows and Tree Martins that are normally found hawking in flight. Insects grounded, birds seek insects on ground! Dusky Robins, a Tasmanian endemic, are almost exclusively ground feeders, although they will chase the odd flying insect, or pick at insects on bark. Surprisingly, they take their share of skinks (small lizards) too. On most mornings, I hear their mournful two note contact call, as family groups move through the light bush. The young still showing a few rufous feathers as they 'emerge' from the juvenile plumage. On one recent morni ng, I decided to observe them more closely and stood amongst the scrub just watching, taking the odd photograph as the opportunity offered. They spend much of their time on a low branch or stump, usually facing the sun and just watching for any movement among the woodland debris. Dropping down and seizing their prey, often returning to a perch to consume it. On the menu this particular morning appeared to be mostly small grubs. Their grey brown plumage matches the surroundings all too well (from my perspective) and I missed several good photographic opportunities as I'd failed to notice a close approach until they moved on. Nearby I occasionally caught sight of a pair of Scarlet Robins; the female coming close enough to photograph; feeding in much the same style as the Duskys, although they often picked insects off the acacia leaves, as did small flocks of Superb Fairy-wrens, Brown and Yellow-rumped Thornbills and Silvereyes. Unlike the Dusky Robins, which forage widely through the woodland, the several pairs of Scarlet Robin at this venue rarely move far from their territories, and are present, with males announcing their occupation, all year round. At one point the bush went silent, and from experience this usually means that a predator is present. I had earlier heard the unmistakable Brown Falcon "kekeke" call as one flew over, and Forest Ravens can sometimes have a similar effect, and there was no lack of them. But I'd had a very brief view of a bird landing in a nearby pine, and although through the binoculars I could only see a portion of the bird, it was enough to confirm that it was a Brown Goshawk. It had presumably seen me too as it flew off. 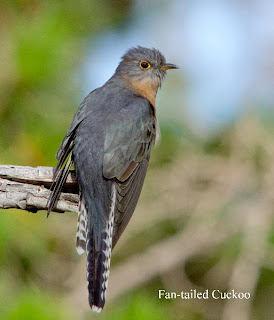 After such events the bush can remain silent for a good while and I was considering moving on, but luck must have been with me, as a juvenile Fan-tailed Cuckoo almost immediately flew into the area. I took a few shots, in hope more than expectation in the mottled light. 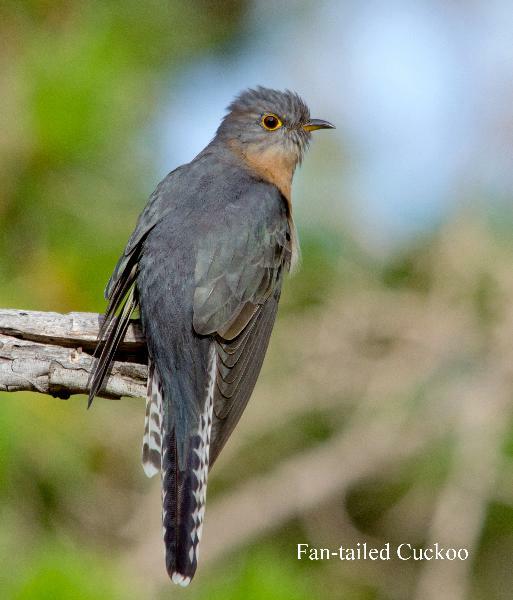 As I stood there reviewing the recently taken images, I noticed a movement to my right and there in all its' glory was an adult Fan-tailed Cuckoo right in front of me! Time for a few shots before it too moved on. I decided that I'd probably used up all my good fortune and it was time to get back to review my handiwork on my PC. A very interesting morning. I hadn't been out birding for several days, and in some frustration, finally chose a less than optimal day to try my luck and drove down to the Lauderdale Spit. With the temperature in single digits and a gale force wind blowing, as it had for the last week, it probably wasn't the best spot for someone suffering a debilitating chest complaint, but I persevered. As you might guess, most birds had found a more sheltered spot, but it did highlight one significant issue--the importance of this area of Ralph's Bay to Pied Oystercatchers. The Australian population of this oystercatcher is estimated at around 10,000 individuals, and on this small spit I counted 353, and there may have been others I missed hunkered down in the vegetation. That's well over 3% of the entire (World) population. Many of these birds would normally roost in other bays, but the severe weather and high tides meant that this was one of the few roost sites left. In some states the Pied Oystercatcher is on the "threatened" list, mainly due to habitat loss and human disturbance. The recent failed attempt to develop this area for canal style housing, shows just how easily this can occur. I was able to get close enough to take a few shots without disturbing the flock--important at any time, more so in the conditions--and the image shows a small part of the roost. This is one photo opportunity that I gladly pass on! At the moment, in almost any Hobart suburb, you'll find the eucalyptus ficifolia flowering. 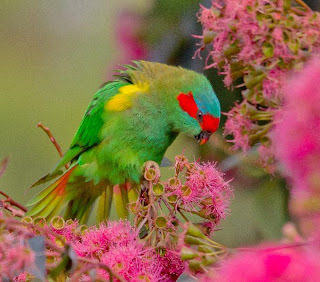 Their attractive bright red to pink flowers are at their peak, and you can't miss them and neither do the local Musk Lorikeets. I've chosen a few images from the umpteen that I've taken in the last few days. 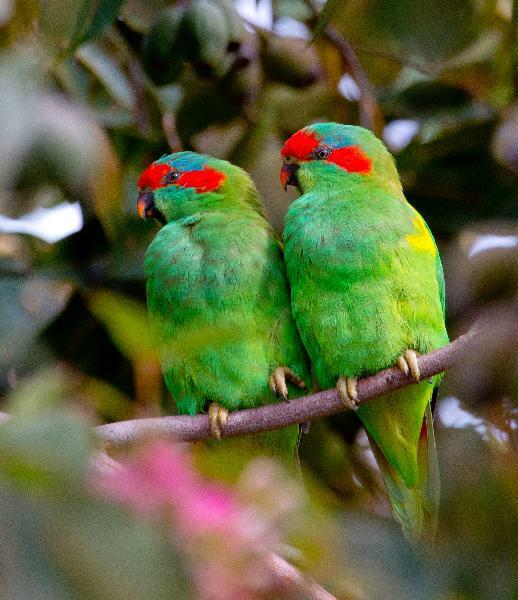 Even if you're not into photography, it's worth spending a while just watching these stunningly coloured parrots. 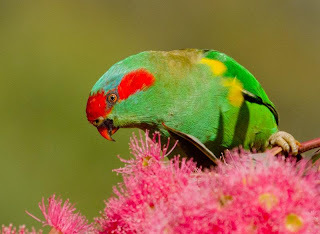 Within a kilometre of my home there must be a dozen or more of these flowering gums, most with a swag of feeding lorikeets, I even have one in my garden, unfortunately not the easiest to access for photography (poor planning on my part!). The Musks tend to feed early morning and late afternoon, but you'll probably find a few at any time of day. Choose a tree in bright conditions to best show off the colourful mix of flowers and bird. Be patient, approach the tree slowly, they'll usually quickly accept your presence, keep still and you're in business. You'll probably need to take quite a few shots to get a worthwhile image as they are fast moving feeders and of ten feed hanging upside down. If you spend time watching, you'll note that most are paired, and you can't fail to note their constant contact calls, occasionally punctuated by screeching as they squabble. Several birds exhibited eye damage, and I saw several birds fly into nearby windows, particularly in overcast conditions. You may at times find the noise all too much! I've included the shot at above left to show a lorikeet "shivering" with tail fanned, this is a threat display, probably a bird getting too close to its' other half. This is sometimes followed by chasing, but seldom any serious confrontations and is over quickly. I suspect that those living in close proximity to these flowering gums may not be as enthusiastic about them as I am! Their screeching can be pretty wearing. But this eucalypt has a short flowering season and peace will return soon. In the Spring of 2010 (late Sept-early Oct) My son, Matthew and I spent 10 days in the Alice Springs area. 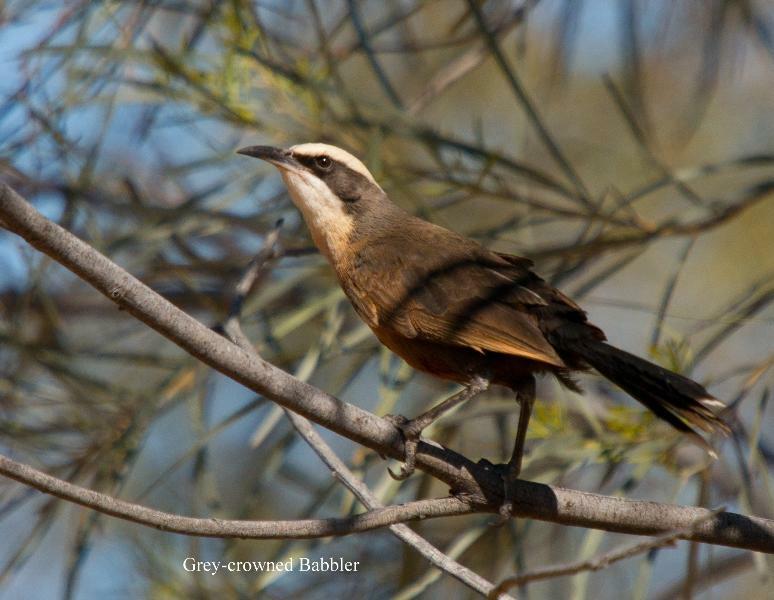 As many birders would be aware, the "Red Centre" had in 2010, one of the highest rainfall in many years, and we took the opportunity to bird and photograph in the general area of Alice Springs. While I'm in the throes of deciding the blog's future, I thought I'd take the opportunity to post shots of some of the birds we saw. Because of the rain, the desert had vast swathes of plants and shrubs, many of them in flower, which in turn had attr acted large numbers of birds, many of them breeding. A fantastic trip. Part one shows Babblers and Robins. During the last few weeks I've come across several would be bird photographers. I can say with some believe that they are readers of this blog as they seem to be visiting the same areas that I've written about, so on the face of it I should be pleased! Nonetheless their activities have caused me some angst. If your going to involve yourself in this pursuit there is a need to understand it comes with some "rules". If you use playback, use it sparingly, not for extended periods. 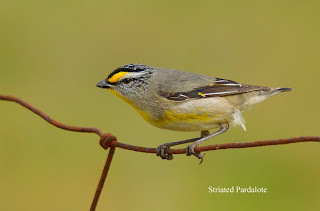 Don't sit near birds that are nesting for extended periods--in this day of digital imagery, it's quite unnecessary anyway to photograph at nest sites and impinges on the activities of the birds. Don't unnecessarily disturb roosting birds. One photographer returned to the same nest site for at least three days, and was surprised that the birds had apparently "disappeared". In talking to a few of them, they appear to have only a rudimentary knowledge of birds, so I suspect they lack the understanding of the need to learn the skills that pertain to bird friendly photography. Too many appear to only be interested in their photography with no concern for the birds. 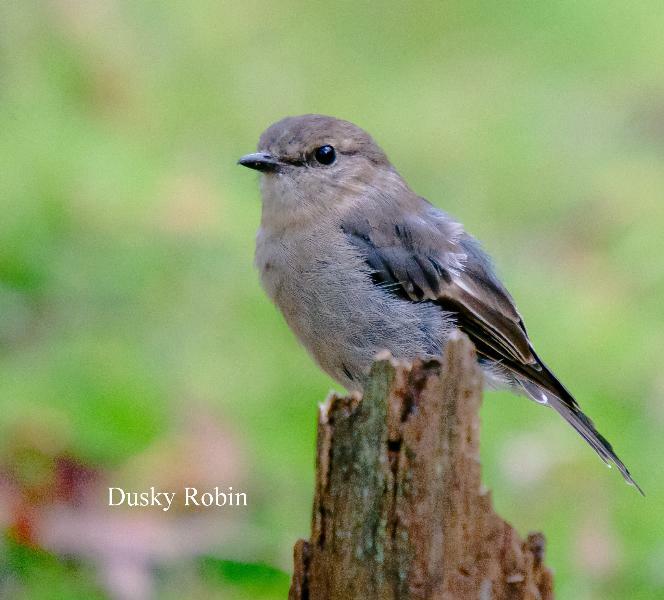 The welfare of the birds should be paramount in your approach to photography.